ByMary E. Kite, Bernard E. Whitley, Jr. 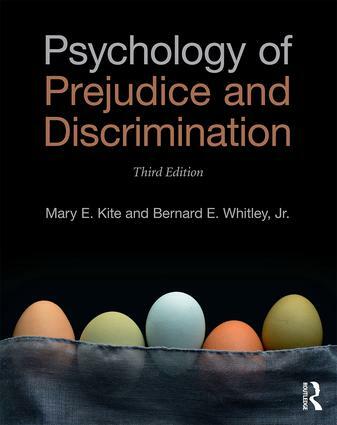 Psychology of Prejudice and Discrimination provides a comprehensive and compelling overview of what psychological theory and research have to say about the nature, causes, and reduction of prejudice and discrimination. It balances a detailed discussion of theories and selected research with applied examples that ensure the material is relevant to students. Newly revised and updated, this edition addresses several interlocking themes, such as research methods, the development of prejudice in children, the relationship between prejudice and discrimination, and discrimination in the workplace, which are developed in greater detail than in other textbooks. For instructor resources, consult the companion website (http://www.routledge.com/cw/Kite), which includes an Instructor Manual that contains activities and tools to help with teaching a prejudice and discrimination course; PowerPoint slides for every chapter; and a Test Bank with exam questions for every chapter for a total of over 1,700 questions.